A few days ago, a young friend of mine who I've known for the entirety of her five years, brought me a gift. 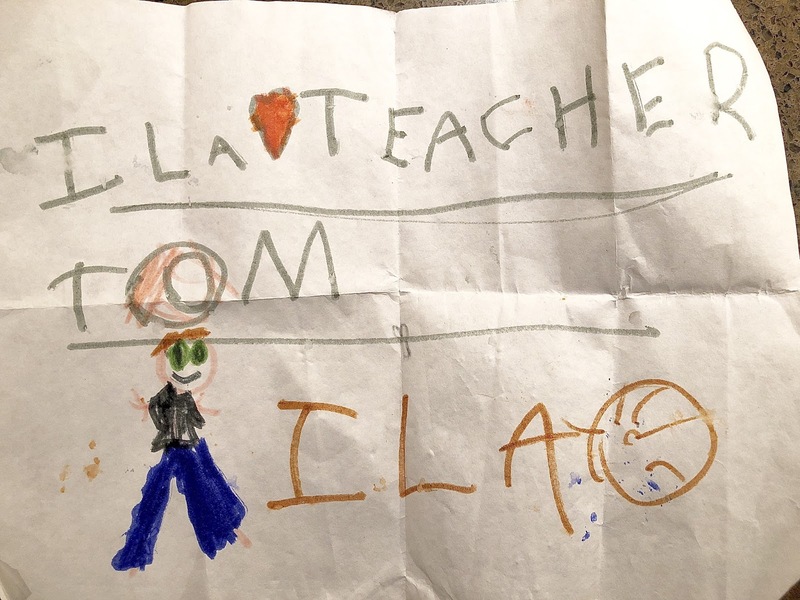 It was a picture she had drawn of me along with a message written in her own hand: "Ila (hearts) Teacher Tom." I probably receive a couple of these a week, pictures or other handmade gifts from the children I teach. They are often grubby, wrinkled, and torn from the effort of creation, and as I talk with them, I always learn that every little mark or doodle has a story behind it. Some time ago I found myself in a friendly debate with a professional who I hold in high esteem. He argued that young children are essentially selfish. 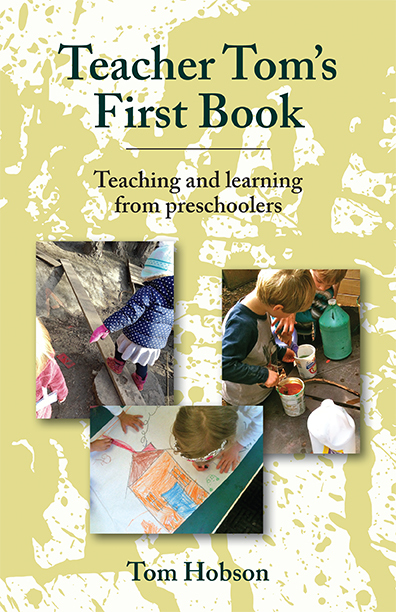 Not that he was judging them, but rather, he believed, the ability to view the world unselfishly was a developmental stage that most preschoolers had not reached. I've not found that to be true. Certainly, young children can be selfish, just like all of us, and some of them tend to be more selfish than others, but every day, all around me, I see young children disproving my esteemed colleague's theory. What I do see are children objecting to being told what to do. I see them sulking when commanded into sharing. I see them reacting angrily, sometimes even violently, to having something snatched from their hands, but, almost without fail, when a child asks for a portion or a turn, they receive it, usually gladly. Every day, I bring conflicts to an end, or even nip them in the bud, by simply pointing out, for instance, "Eleanor doesn't have any play dough," a piece of information that a young child might not have discerned on her own, but that once clearly stated will respond to by generously breaking off a piece of her own play dough for the child who has none. Even in the lead up to the December holidays, I've discovered that children are at least as excited about the gifts they are giving as those they are about to receive. If "selfishness" is acting without consideration of others for one's own personal profit or benefit, then "unselfishness" is sitting down with a piece of paper and a marker and spending time creating a gift. 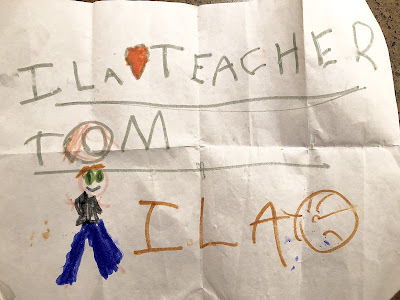 I would have to be incredibly selfish myself to not see the generosity in Ila's picture. She labored over those letters, shaping them carefully, for me, considering my feelings as she did. 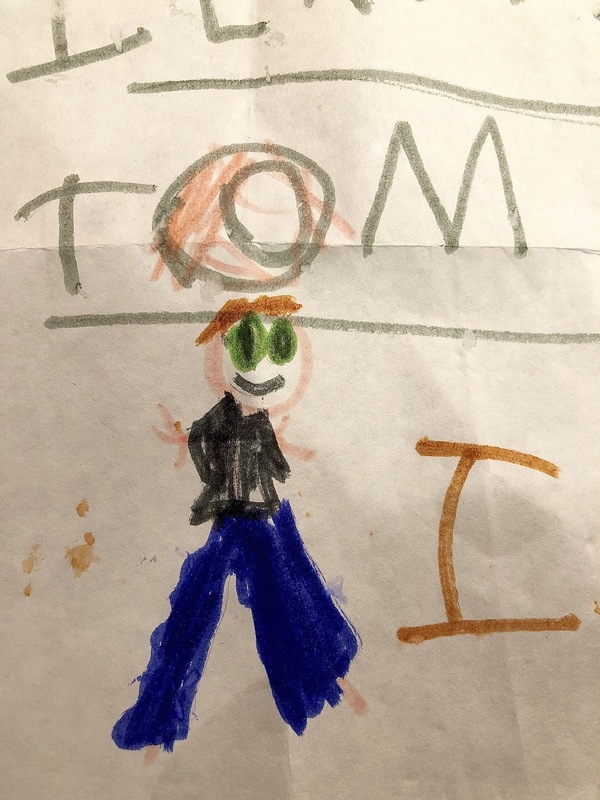 She reflected on my physical appearance, drawing a portrait, for me, that included the blue jeans I wear every day, my glasses, a shirt she has seem me wear many times. As she presented the picture to me, I learned that she had wanted to get the color of my eyes right and was disappointed that she had guessed green instead of blue. This picture was not for her own personal profit or benefit, but for mine, one created expressly and thoughtfully for me. If that is not an example of unselfishness then I don't know what is. Ila gave me the picture on the playground, so after we had discussed it, I folded it up to fit into my jacket pocket. She had put so much unselfish thought into this gift and it made me feel exactly as she had hoped, I expect: loved and treasured. Several times over the past few days, I've felt the paper in my pocket, wondered what it was, then opened it to find that it made me feel loved and treasured all over again.